We’d love your help. 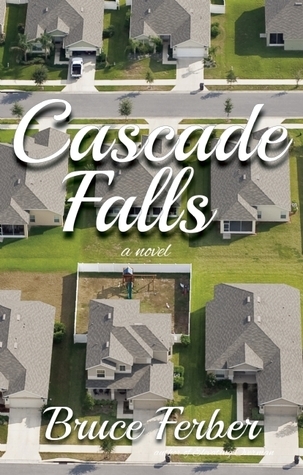 Let us know what’s wrong with this preview of Cascade Falls by Bruce Ferber. Cascade Falls explores the failed promise of the American Dream. Raised to believe that with hard work, anything is possible, a staggering number of Americans hate their jobs and see little chance of ever escaping the grind. In his tragicomic followup to the laugh-ridden Elevating Overman, Bruce Ferber asks the question: "How does giving up our dreams affect our relationsh Cascade Falls explores the failed promise of the American Dream. Raised to believe that with hard work, anything is possible, a staggering number of Americans hate their jobs and see little chance of ever escaping the grind. In his tragicomic followup to the laugh-ridden Elevating Overman, Bruce Ferber asks the question: "How does giving up our dreams affect our relationships and our psyches?" To ask other readers questions about Cascade Falls, please sign up. Bruce Ferber's gentle narrative style slyly masks a much more serious question, one the disillusioned suburbanites at the core of Cascade Falls might as well be asking on the part of us all: namely, what does the American Dream mean these days, and to whom does its storied set of tenets apply? Ferber reminds us that no matter how well off you think you are, there's always room to fall, and yet no matter how far you've fallen, there's also room in your remaining space and years to find your best Bruce Ferber's gentle narrative style slyly masks a much more serious question, one the disillusioned suburbanites at the core of Cascade Falls might as well be asking on the part of us all: namely, what does the American Dream mean these days, and to whom does its storied set of tenets apply? Ferber reminds us that no matter how well off you think you are, there's always room to fall, and yet no matter how far you've fallen, there's also room in your remaining space and years to find your best self. Cascade Falls is one hell of a book! Ferber paints the familiar trappings of suburbia with a dry wit that will make you laugh out loud. However, Cascade Falls is much more than a mere parody of life in an Arizona subdivision. The master-planned community proves the furnace in which the characters are brought face to face with their demons, and must rise like the Phoenix for a second chance at life. A bit thin in terms of plot and characterization. Not too bad, but I kept expecting things to get funnier and more interesting. Then the story ended. Not what i thought it would be. Read a much bette book before this one so it didn't have much of a chance with me. A guy's story, maybe. Bruce Ferber is an Emmy and Golden Globe-nominated comedy writer and producer whose credits include Bosom Buddies, Growing Pains, Sabrina, The Teenage Witch, Coach, and Home Improvement, where he served as Executive Producer and showrunner. In addition to being recognized by the Television Academy, his work has received the People’s Choice, Kid’s Choice and Environmental Media Awards. Ferber lives Bruce Ferber is an Emmy and Golden Globe-nominated comedy writer and producer whose credits include Bosom Buddies, Growing Pains, Sabrina, The Teenage Witch, Coach, and Home Improvement, where he served as Executive Producer and showrunner. In addition to being recognized by the Television Academy, his work has received the People’s Choice, Kid’s Choice and Environmental Media Awards. Ferber lives in Southern California, with his wife, children, large dog, and assorted musical instruments. Elevating Overman is his first novel.